Cycling in Europe: Untried or tried and found wanting! Untried or tried and found wanting! We’ve often written advice about trying out equipment and reading instructions in our guides before setting off on tours. Like everyone else we frequently ignore this ourselves. Bikes after all are bikes and the basic principles of repair and maintenance apply whether they are foldies or mountain bikes. Or do they? Bicycle mechanics would probably assure us otherwise as technical changes and new systems of gearing have moved apace recently. We’d set off for Switzerland to fill in some gaps on the lowland routes using our Dahon Speed TR folding bikes. It was Sunday and the morning mist rolled back as we sweated up the hill from the Lake Constance ferry point to the city of Konstanz itself. At the hilltop Neil's chain jammed. The usual hooking with the knife can opener failed to free it. A nearby church porch offered shade and protection from helpful passers-by as it seemed probable that the back wheel would have to come out. At this point he removed the Sram gear changer, which just slips off and was just about to loosen the wheel nuts when I suggested taking the luggage off and turning the bike upside down to reduce tension on the chain. I have bad memories of early tussles with Brompton back wheels and of course the instructions were, in the interests of weight saving, back in Viernheim. Suddenly the chain came free and Neil restored the Sram fitting. Both of us shed some clothing and munched down a sandwich and pasty bought en route in Wasserburg. We got back on the bikes prepared to whizz through Konstanz and out along the north bank of the Bodensee in fine style. Hmm - it turns out that to reattach a Sram changer needs a qualification in Fine Mechanics 101 and the patience of Job. For the uninitiated our Dahons have theoretically 21 gears. A handlebar lever operates the Sram hub gears in three ranges, whilst a twist Derailleur offers 7 variations in each range. It sounds complicated but works like a charm since you can flick the Sram into high or low when sudden ascents or descents present themselves. Inspection of my Sram revealed a yellow bar, missing on Neil's which also failed to offer him most of the 21 options. More fiddling brought some improvement and he opted to grin and bear it for the rest of the trip to Gailingen, a German semi-enclave surrounded by Switzerland on three sides on the north bank of the Rhine. The final section is along a walker's path through the woods, up a steep climb, fairly tortuous on a healthy bike and a real grind on a sick one, so we were relieved to reach our overnight destination. Unlikely under the circumstances of the missing gears on Neil's bike and the knowledge that Swiss bike shops are closed on Mondays. (Don't ask us, it was a Monday of course). We stocked up on necessities in Euroland Gailingen and headed along a green silent Rhine into Schaffhausen, pinning our hopes on a bikebuilder who had correctly fettled Neil's front fork assembly last year. He was 'away in Taiwan, at a bike show, back tomorrow'. All the other four shops were...closed so we continued, along, up and down past the Rhine Falls, eschewing the pay toilets at the Falls in favour of a woodland view. On through some delightful small villages until we hit a long rough section through lovely woods by Zurzach, every tree producing pollen by the ton, my eyes said, and eventually over the Rhine into Germany by late afternoon. My front fork assembly had reacted badly to the Rhine gravels and suddenly the bike was unrideable as it yawed and strayed from the intended course. This was no joke since hoards of Swiss shoppers were pouring by car into the Euroland shops (and more importantly the customs office where they reclaim the German VAT in Rheinheim), whilst German workers were returning home from better paid jobs in Switzerland. Fortunately we knew of a cycle repair shop here and I walked the last few yards, pushing my sick bike. The mechanic looked somewhat bemused as the handlebars waggled in all directions and I revealed the seat of the problem by folding back the handlebars. No one looked hopeful. However in 15 mins or so he returned, not convinced he had cured the problem and refused to take any payment. Amazingly to date I've had no further problems, nor have the handlebars slipped sideways on rough paths. Under the circumstances Neil felt he could not mention the Sram problem so he persevered up some horrible hills until we reached our overnight stop with friends. Early next morning another local mechanic did some more fiddling with the Sram until he persuaded another lever to click and hold and Neil finally had a full set of gears, very useful as the route includes many short steep climbs and downhills. So clearly we’ll have to bore even more holes in our toothbrush handles to compensate for the weight of the instructions next time we set off - and take our own instructions to heart! Interesting! I've just bought a Speed TR (not arrived yet). Apart from the woes you describe here would you recommend it in general? We bought the Dahons to use to research Swiss cycle routes for our book ‘Cycling in Switzerland’ due out at the end of the year. We wanted to be able to transport them free on trains, but needed something with more umph than our Bromptons.The Dahons are great to ride, the combination of the Sram and Derailleur gears enabled us to ride up just about everything in the Alps, including the Furka Pass from Andermatt. They are certainly less tiring over hills and longer distances than our Brompton T5s. We like the ride position, Big Apple tyres, seat suspension, luggage carrying and hydraulic brakes. In folded mode they are cumbersome, the package is rather large and unless you are big and strong, frankly they are a pain. I’m a short, 64 year old female...so you can imagine I find it hard work getting on or off a train clutching a Dahon. A Brompton I can manage. Plus the chain is on the outside when folded so oil tends to get on hands, legs or clothing. Both of us have had trouble with the steering. Whether ours were poorly assembled or it is an endemic fault we don’t know. My handlebars had a tendency to slip sideways riding over gravel so they were not at right angle to the front post. Neil’s were extremely stiff and then the whole thing just became loose and floppy. 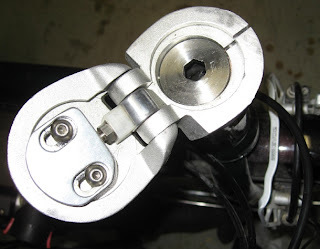 The cone assembly below the front post fold may be incorrectly assembled and work loose. 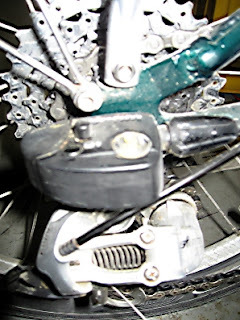 The steering then wobbles and yaws, braking hard causes the handlebars to move backwards, so I felt they might collapse. My temporary solution was to only use the rear brake until the problem was sorted by tightening the assembly - it has been OK for 200km to date. Neil’s bike was first of all glued together at the steering cone (as we discovered during the final surgery his bike) by a cowboy repairer. Then it was steamed apart by a master bike builder in Schaffhausen, the ends of the tubes reground and polished and the cone assembly reinserted and tightened. This took about 2 hours and the supplier paid for the work, not us. Since then he has ridden more than 1000km on the bike. We’re certainly going on using them, though we suspect their quality control could be better, and we’ve learned to live with them folded by making sure we’ve time enough to fold them, bag them and get on the train without a rush. Getting off they are great for repelling passengers trying to board since they take up all available doorway space. We’re writing an article comparing the Brompton and the Dahon for AtoB magazine, but don’t know when or if it will be published! Have fun with the bike nevertheless!